The Pilot is a wearable device that slips easily into your ear, translating the words of others into your preferred language. (The Pilot, a Babel Fish! Waverly Labs plans to launch a crowdfunding campaign on Indiegogo where interested people will be able to pre-order the Pilot for between $129 (£90) and $179 (£125) but it's expected to retail for between $250 (£174) and $300 (£209). Pre-orders are expected to open from 25 May, with the earpieces shipping between autumn and next spring, on a first-come-first-served basis. They will come in three colours. The Babel fish is small, yellow and leechlike, and probably the oddest thing in the Universe. It feeds on brainwave energy received not from its own carrier but from those around it. It absorbs all unconscious mental frequencies from this brainwave energy to nourish itself with. It then excretes into the mind of its carrier a telepathic matrix formed by combining the conscious thought frequencies with nerve signals picked up from the speech centres of the brain which has supplied them. The practical upshot of all this is that if you stick a Babel fish in your ear you can instantly understand anything said to you in any form of language. 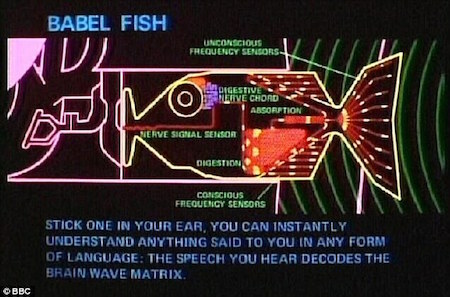 The speech patterns you actually hear decode the brainwave matrix which has been fed into your mind by your Babel fish. Via Daily Mail and Waverly Labs..